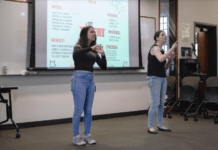 Every semester the Harrington School of Communications and Film Media hosts free screenings for the films that students have produced throughout the semester. 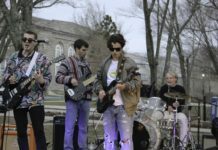 The evenings are known to bring a variety of talent and entertainment to the hundreds of young filmmakers on campus, and the rest of the student body. This year’s screenings are held on Wednesday, Dec. 13 and Thursday Dec. 14 at 6 p.m. in the Swan Hall auditorium. The screenings will feature work from three different classes, Wednesday Dec. 13 will feature films from the class FLM 110: Introduction to Film Media Production. The following night, Thursday Dec. 14, will showcase films from the FLM 351: Topics in Film Media Production and FLM 445: Advanced Narrative Production classes. Junior Sean Fay-Wolfe and freshman Hamza Bhawana have been working as a duo for two film projects for the FLM 110: Introduction to Film Media Production. Fay-Wolfe and Bhawana came together to work on a project for the class and have since realized how well they work together. Fay-Wolfe is in charge of writing the scripts and acting while Bhawana is in charge of all the cinematography. “He brings me a story and we put it into action,” Bhawana said. Their first film, “The Wrong Side of the Wall,” is a silent narrative film about a man who has a lingering fear of the undeveloped side of his basement. However, they are excited about their final film project with the working title, “Thank You For Calling,” which actually came from a longer and more complex idea. Originally the duo planned to write a film around the idea of a main character who hears a word that seems innocuous and who goes from place to place and gets in trouble on his quest to find the definition of the word. Fay-Wolfe hopes that the they can complete the film at some point in the future. “Thank You for Calling,” is about a customer service representative who every day randomly picks one person at random to shut off cable to. The film centers around a the agent and a customer who is a victim of the agent. The duo hopes that the audience can gain an appreciation for how much effort goes into actually making a film project. Fay-Wolfe described that they worked countless hours just to be able to get a 7 minute video. Another film major, Sunny Davis, is working on her two film projects for her Film 351 class, titled “Noblism” and “What We Fear in the Dark.” Davis described herself as being a storyteller and remembers how she learned to tell stories both on paper and on screen and that is what has motivated her passion for film. Her first project, “Noblism,” originated out of a class competition where the class got to vote on their favorite script and then everyone in the class helped in the making of the project. “[It’s] about this kind of crazy guy who thinks that because he doesn’t like to put clothes on in the morning he can create a religion out of it and he does and he gets a small following out of it.,” Davis said. Davis’ other project, “What We Fear in the Dark,” is an experimental film about a person addressing their inner experiences. 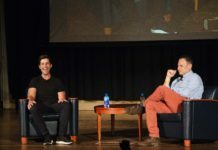 “It’s about exploring the inner demons of a person and what drives someone to do bad things and bad deeds and how it kind of catches up to them,” Davis said. The main character gets constantly confronted with his little bad deeds he has done throughout his life and how he has contributed to problems as a bystander.